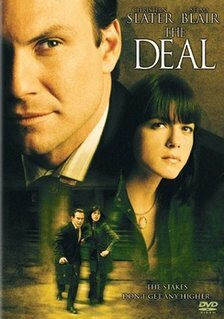 The Deal is an entertaining, but flawed political thriller. Christian Slater plays Tom, a man about to close a huge oil deal. But everything doesn't go as scheduled, because blackmail and murder go hand in hand on Wall Street. Christian Slater is very convincing in his role. Selma Blair looks bored. John Heard does nothing to advance the plot. Angie Harmon plays a Russian spy. Her accent is off the mark. The movie tries to be different because the climax involves not gunfire, (well there's some) but talking. It doesn't really work. But overall, it's worth seeing for Slater's performance.